Will Google Knowledge Vault undermine or help your Online Marketing? 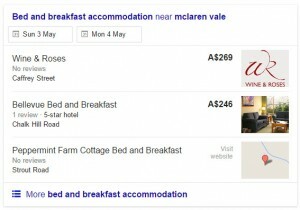 If you are in the accommodation industry you’ll be VERY INTERESTED to see a new Google search result element for accommodation related searches. While I haven’t stumbled over this one until now, it may have been around for a while – or not – who knows. It looks much like a reformatted Google Plus search result – however I suspect this is a Google Knowledge Vault ‘element’ – at least until someone shows me it isnt. This follows the trend of Google’s ongoing introduction of their own search results which Im assuming is part of Google’s ‘knowledge vault project’. movie search results showing movies ‘now showing’ – been shown for years now. How does this impact your business ? So if your online marketing strategy – like many businesses – is to provide content that features in Google searches to attract prospective clients, how do you deal with Google suddenly bypassing your website’s search results – maybe even using data that it sourced from your site – and showing that information directly in the search results ? I have seen some of these search result elements that do attribute the data source. If it happens in your market segment do you have any options other than using Google paid advertising ? http://succinctideas.com.au/wp2/wp-content/uploads/2014/08/si-colour-logo-300x137.png 0 0 pete http://succinctideas.com.au/wp2/wp-content/uploads/2014/08/si-colour-logo-300x137.png pete2015-04-22 08:40:062015-04-22 08:40:06Will Google Knowledge Vault undermine or help your Online Marketing?